Architecture is about space and light and light colors life. All forms of life, natural or man made take their shape and surface identity through color. It is also about accessability and comfort, all individuals appearing to have special needs, some more than others. Our practice is about space, light and color. We serve our clients through simply choosing paint colors for their existing home, remodeling or designing a new building with color and texture, an integral part of shape modeled by light. John came to color through architecture, a love of Mexico and his innate joy of life. Margaret came to color as a little girl looking at art books on cold Michigan days, visiting exhibits at the nearby Cranbrook Academy of Art, and traveling to Mexico as a teen. Both have had a lifelong involvement in the visual and performing arts as part of the audience which has excited and honed their visual skills of color and shape relationships. It all seems to be about relationships, in the arts and one’s personal life. Their office is in their home studio in the River Road Neighborhood of San Antonio, Texas, and also in San Miguel de Allende, Mexico. John Larcade has practiced architecture in San Antonio for over 35 years, with a commitment to contemporary design; and before that in New York City. He also worked in Colombia, South America as a Peace Corps volunteer designing and building rural schools where he became fluent in Spanish and began a love for life “south of the border”. John received his Bachelor of Architecture from the University of Texas at Austin, and his Master’s degree from Columbia University. 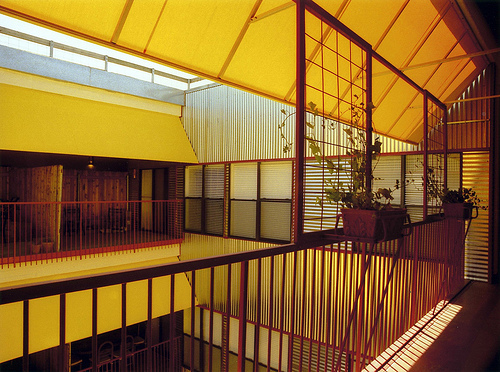 He returned to Texas to teach design and structures at the University of Houston for two years. For the last 32 years he has been a principal in Lance, Larcade and Bechtol, Architects and Planning Consultants with long time friends Mike Lance and Ron Bechtol. He also served on the architectural design faculty of San Antonio College and the University of Texas at San Antonio for many years. Many of the project show on this website were completed by Lance, Larcade and Bechtol, Architects. This new venture, a partnership with Margaret, to work on architectural projects, interior design and color brings together their love of contemporary design and the traditions of Mexico, South America and the Mediterranean countries. John’s knowledge of architectural history and indigenous building methods has always informed his work and attitudes about creating energy efficient and sustainable buildings. He has designed numerous homes in San Miguel de Allende, Mexico, where he and Margaret have a second home. John is current with all the new American with Disabilities Act information and takes pleasure in creating handsome accessable modifications for homes and offices. Margaret Larcade’s first interior design job was in New York City, working in an architectural and store planning firm on large department stores and small boutiques. She was responsible for every finish material and color, wallpaper, furniture and fabric used in these projects, learning to work with multiple contractors. She also immersed herself in the furniture and textile houses, caressing glorious fabrics and sitting on almost every piece of mid-century modern furniture. She studied interior design at Syracuse University and upon graduation she went to New York City where she studied at the New York School of Interior Design. She furthered her skills with a year off by immersing herself in the American Craft Movement studying ceramics and metals. She met John at Oppenheimer and Brady Architects where she was the interior designer and was assigned to several of his projects. They married and moved first to Houston, then to San Antonio where Margaret practiced interior design working on projects with John and his two partners, Mike Lance and Ron Bechtol. In the last 6 years she has added color consulting to her resume. Some of her exterior color work can be seen in the historic Monte Vista area and in Alamo Heights in San Antonio. Margaret took time off to raise a family and along with John has two adult children. Their son was born with disabilities which led to co-founding The Parent Information Exchange for Children with Special Needs and spending many years on disability issues. Now with adult children she has returned full time to her passion for art, design, color and the folk arts and crafts from Scandinavia to South America. Her Spanish is good enough to mix colors in Spanish speaking countries and loves to work in San Miguel de Allende combining the colonial and contemporary traditions.